A decade ago, in an authoritative scientific magazine, we published a prediction (1) on the synthesis of complicated molecules, primarily medicines. 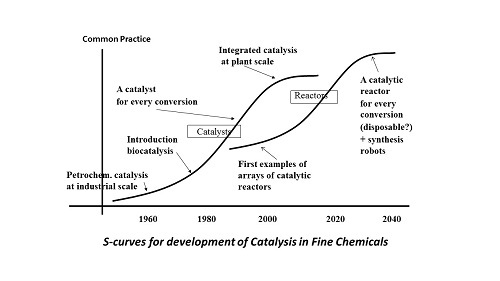 We foresaw the integration of chemo and bio catalysis in a reactor that would also be the catalyst. A very efficient system and a dream come true for the pharmaceutical industry: the computer would devise the synthesis scheme, and this would be executed by robots in a large number of connected catalytic mini reactors. But since then, industry has taken another development path. 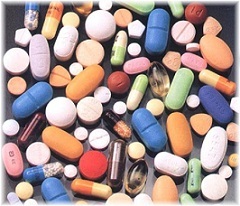 Molecular structures of medicines have got complicated to such an extent that even modern chemistry cannot handle them. In industry, this leads to inefficient chemical processes with lots of waste. The clock turned back! But with more (semi)natural medicines and with the aid of synthetic biology, an efficient system, leading to a more sustainable medicines production might be realised after all. By choosing another development pathway, industry could develop a more sustainable medicines production. We had an elegant system in mind, in which design and production of medicines would be integrated. The synthesis of new medicines (or the lead molecules from which they are produced) would be automated; it could be done in sufficient quantities to allow some preliminary tests on their possible effectiveness. A major advantage would be that problems in scaling up would be avoided. In chemical industry, it is often a large step from lab to fab, a step that causes much headache and many interim failures. In our system, the synthesis of small quantities would be representative for large-scale production. The system would consist of a series of smartly connected reactors, each reactor containing the catalyst for the desired reaction, in the lab at a micro scale, down to the level of reactions on a chip. This would close the gap between tests and later commercial production, simply by multiplying the number of reactor chips. Catalysis plays a key role in petro chemistry, in which relatively simple molecules are synthesised. 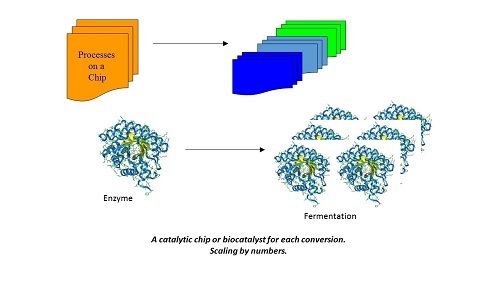 The advent of bio catalysis using enzymes some 30 years ago led to a more efficient manufacturing processes for a wider and more sophisticated range of molecules, like nutraceuticals, vitamins and medicines. For each reaction we now have available at least one catalyst, often a number of them. Connecting reactions, each with a catalyst of its own, is increasingly successful. That is the left-hand S-curve. In industrial practice the effects of this show primarily in fine chemistry, the industrial branch that produces medicines and the like. For major existing medicines like antibiotics and cardiovascular drugs, industrial processes are very much optimised. The processes use both bio and chemo catalysis and the amount of waste per kg of end product (a useful though coarse indicator of efficiency) has been reduced from tens of kgs to some kgs. Moreover, waste products tend to be much more environmentally benign, and many recycling opportunities have been developed. In industry, we can witness the first steps towards integration of catalysts and reactors, in the form of enzymes that have been absorbed at materials (immobilised) in dedicated reactors. For decades already, reactors and catalysts in petro chemistry are part of an integral design. All developments seemed to indicate that fine chemistry would follow suit. The step towards the second S-curve (the discontinuity) seemed logical: fine chemistry would develop as petro chemistry had done. In scientific literature, articles abound on the integration of catalyst and reactor that we foresaw. 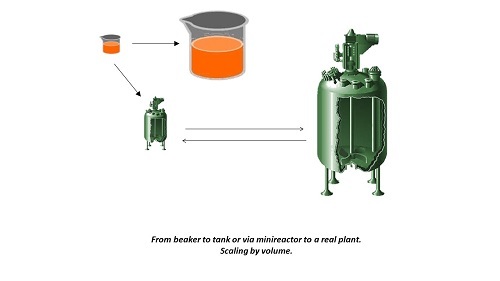 In micro reactors we can execute four or five consecutive synthesis steps. We are able to mount several catalytic reactors on one chip, wonderful technology. We can also connect bio catalysts by the absorption of multiple enzymes on a surface. But meanwhile, the pharmaceutical industry takes another development route. 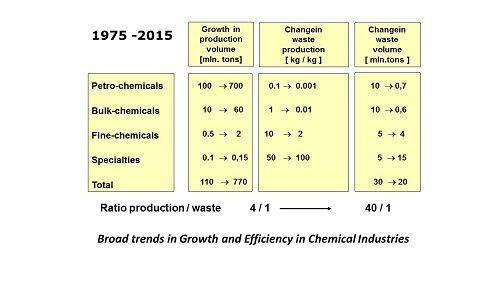 The indicator for that is the waste production per kg of end product: this does not fall any more in the production of the latest medicines, but sharply rises instead, in some instances to more than a ton of waste per kg of end product. We had not foreseen the very rapid increase of the molecular complexity of new medicines. The cause of this is the new facility of automatically generating major libraries of possible molecules for new medicines. Once these are discovered, researchers are faced with an immense time pressure to develop a new drug as fast as possible. Industry would like to have the candidates with possible medicinal properties available for the first tests, as soon as the computer has indicated them from these libraries. Chemists in the lab return to old-fashioned, well-known pathways, and do not take (or get) the time required to devise possibly more efficient catalytic processes, let alone reactors that would fit these to measure. ‘We can do this later, if our substance proves to be a successful drug.’ Because always there are many more failures than successes. But alas, this time never comes. Upon the first successful tests, industry requires more of the same, with the same quality. So chemists repeat their first cumbersome pathway. And so on, until they have reached the stage of commercialisation. On top of this, these most modern medicines are so complex that even very skilled chemists would not be able to develop quickly enough a smart series of some dozens of catalysts and reactors for them. Chemists and process technologists can hardly consider modern catalysis, and take recourse to old-fashioned chemistry with a lot of ballast and detours, and with immense amounts of waste. So far, that is not too problematic as the new medicines are so powerful that often they are effective in doses of just one or a few milligrams. Total global demand may not be more than a few tons. Therefore, waste can be managed so far, even though this is a shame for chemical scientists. Maybe, if the drug would become a worldwide success, they would get the opportunity to develop a very fine integrated process, with the help of smart catalysis in connected reactors. But then there might be the FDA or another powerful regulatory body that could turn any change in production or makeup of a medicine into a nightmare. We may approach this matter from another angle if we define the biological cell as an mini reactor. The DNA machinery takes care of the cell being kept alive, of any necessary reproduction in order to produce more little reactors, and of any necessary repairs or replacements. The same DNA also takes care of the production of the enzymes responsible for production of the (natural) compound we are interested in. Bio catalysis is at work here, in the form of an entire series of enzymes that together define the metabolic pathway to the final product. Modern biotechnology increasingly gets to grips with the DNA machinery: genetic modification. For example, by transferring the genetic codes of the antimalarial drug artemisinin from the plant to the E.Coli intestinal bacterium and inducing this organism to produce major amounts of this valuable medicine. This is an example of improvement of nature (the mugwort plant that inefficiently produces artemisinin) by nature (the microorganism that we can train). From the industrial point of view, this development pathway has the major advantage that the large-scale production method of the lead molecules has been done before and developed in the lab (something that saves a lot of time). The biological cell is the reactor, with all its enzymes in the correct order and in the right place. In principle, this is also the route to a large-scale sustainable production. For we can grow as many biological cells, fermentation, as we wish. But there is one major disadvantage to the use of the biological cell. Although the cell contains everything that we could desire – it can perform many steps in a single process – its restriction is that in this way we can only produce natural or semi-natural products. For biotechnologists will have to find the genetic codes for each step in the metabolic pathway in some organism. The closer the medicines to be developed resemble well-known natural products, the easier the task to find the corresponding genetic codes. As the distance from natural structures increases (and that holds true for many modern prospective medicines), the usefulness of this route will diminish. But here, synthetic biology might come to the rescue and enlarge the range quite a bit. Synthetic biology generates genetic information that does not exist in nature but was devised in the human brain and synthesised in the lab. Once introduced into a suitable (micro)organism, it can induce the organism to produce non-natural or semi-natural products by means of bio catalysis as described above. If these new molecules appear to have medicinal properties, the factory is already at the industry’s disposal, so to speak. This is a promising area; for although the field of natural medicines has been researched quite thoroughly already, this would enlarge the arsenal quite a bit. We can bet that along this route, we will find sufficient semi-natural drugs that can be produced in a biological cell through fermentation. This would constitute the integration of reactor and catalyst after all: the right-hand S-curve in our diagram. If the pharmaceutical industry would like to adhere to its very complicated chemo pharmaceutical compounds, this route will not be very promising, and the development towards a more sustainable medicines production might be aborted. But if industry would orient itself towards the vast array of semi-natural medicines that we can produce with the help of synthetic biology, this would constitute an attractive prospect. It would mean phasing out fine chemistry for the production of medicines, but it would lay the base for a more sustainable medicines production. (1) Concepts of Nature in Organic Synthesis: Cascade Catalysis and Multistep Conversions in Concert, Alle Bruggink, Rob Schoevaart, and Tom Kieboom, Organic Process Research & Development 2003, 7, 622-640.